Happy Spring Space Freaks! Hoping all of you are doing well coming out of the Holidays and the coldest month of Winter. The market as is usual had a very strong month in January with a lot of great unique items coming on the scene in the month, as well as strong prices for a lot of staples in our hobby. Thus, whether you were looking for something niche or just to upgrade or acquire something new on the production side, this was definitely a good month to do that. With Celebration Anaheim only just about 5 weeks away as of today I’m expecting to see a bit of a lull in the market leading up to the first few weeks of April. I’ll be bringing you some live coverage of Celebration Anaheim including items from the floor, room sales and one off transactions that I’m privy too. With the new movie coming out and the general excitement that comes along with each Celebration, we’re sure to see some amazing items and all time high prices coming out of the event. This month I have a handful of auctions to look at with the theme being "collections." Lots and collections come up regularly on eBay and we throw them into the mix on the MarketWatch every so often, but after seeing an up tick in the month of January and December I thought we’d just focus on some of these instant collections. It’s amazing what some of these sets go for and the value that some people realize in purchasing in bulk. There were literally dozens of notable collections sold in January through early February and here we bring together just a small sampling. We’ll take a look at what some loose runs go for these days, including a full set of the first 79/92 figures. In addition, we’ll switch over to the packaged world with some MOC lots, most notably a steal on a set of the first 77 MOC. So let’s begin our coverage with where the line started -- the Original 12. Here we have a set of the Original 12 graded by AFA. The varying grades lead way to what is actually a pretty palatable price point. You have figures that would be worth roughly $3-400 loose along with grading costs of $18 a figure ($216 for all 12), leading way to a total of $850, a little high for what you might expect but in the given market not out of this world by any measure. We go from average to a little out of control. Whether you love or hate AFA, most everyone agrees that U-grading (removing items from the package for loose grading) is a horrible practice. In some cases it can be seen as legitimate when a figure's packaging is in pretty abysmal condition, however even that is considered a faux pas to a large portion of the collecting community. U-grading drives up the value of a lot of loose figures given the fact that these items have literally never been touched by human hands outside of the factory and the graders at AFA. This increases demand as a niche group of collectors gravitate towards this segment of collecting. Whether you like the practice or not, it does create a premium with loose figures that didn’t exist before the practice arose. Thus, no matter how hard people fight it, this practice will be around for the foreseeable future. Outside of the U-grades themselves, what we have here is a pretty interesting little collection. Not only do we have the first 21 figures, we also have a lot of variants of these figures, and a store display for the first 21. One aspect that is somewhat comforting is the fact that some of the figure variants were never released during the original Star Wars run, so we can take some solace in knowing that these weren’t all pulled from 12 and 21 back cards, and that some did come from ESB and ROTJ cardbacks. 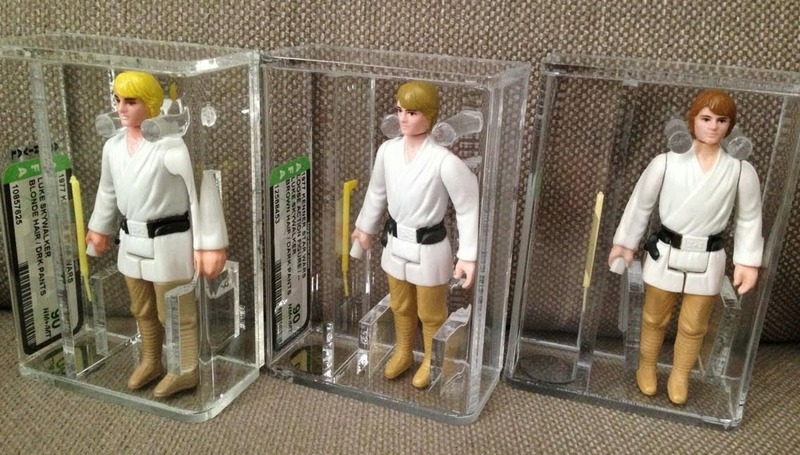 Included in the set of variants are the three different hair colors of Farmboy Luke Skywalker, Tusken Raider with hollow cheeks, Walrusman (pink and white), Jawa (small hood and large hood), and Ben Kenobi (grey and white hair). Overall a nice representation for variant collectors but with a hefty price tag, ten times that of our starting auction. Going from loose to MOC, we have our first of two auctions which were steals when it comes to buying in bulk. This auction is for 16 of the first 21 MOC with a price tag of $3,000 -- quite a bit shy of what Jordan charged one of his customers on Toy Hunter last year for the first 12 plus three 21 backs and well below the market average. The auction itself was won with a best offer and whomever got to it first surely reaped the rewards of staying on their eBay game getting these figures for an average of $187.50 each. Another auction that shows that there’s value in the hobby if you continue to stay on the key sites like eBay, as these figures graded could easily go for $7-10,000. If our last auction didn’t blow your mind this one surely will: the entire run of the first 77 figures MOC on their debut cardbacks for $6,500 -- that’s right, less than $85 a piece ($84.41 to be exact). Now let me start by saying something does seem strange when you look at the listing, it’s a first time eBayer based on the feedback, and the BIN is extremely low. This does raise some questions: was this a scam? Were there fakes? Did the transaction go down smoothly? All of which are completely valid questions given the spread between fair market value and what they actually sold for. I did contact the seller for comment but never saw a response. They could be in hiding, or just simply to embarrassed that they let a $30,000 set of figures go for 1/6th of the value. Nonetheless, let’s assume that everything was on the up and up. This would be proof positive that there are still some ways to get deep into the hobby without breaking the bank and that those who are diligent with keeping an eye on the market can make a huge score. Finishing up the month we have the largest and most expensive of the collections featured. This one's a bit less focused than others but impressive nonetheless. 90 MOC figures for an estimated $16,500, or $183 per figure. This is a great representation of someone's hard work in trying to assemble a full run of MOC figures that spans the full series from ANH to POTF. The figures in the collection are in a variety of different conditions, with a mix of graded and ungraded items. The set includes variants of certain cardbacks and a nearly complete representation of the full line. It's a great view and ultimately a great buy given the per figure cost of $183 a piece, really a steal when you think about the breadth of the collection including several 12 backs, 20 backs and POTF figures, all which carry average MOC prices of well over $200 a piece (depending on condition). Collections like this make me ask why someone would part with something like this; it seemed so close but just not there. Regardless of the reason, the collector and buyer should be proud of what was put together as it truly is a great representation of one collector's hard work and another's awesome find. That wraps up the update for February, check back shortly for our March update featuring single items sold in the month of January and February. The first 77 $6,500 eBay lot seems legit, the seller has had feedback left for the deal. Simply amazing score! !